CREAM was founded by Joseph Mullen, Andy Carroll, James Barton and Darren Hughes as a place to party with friends and family . Cream's opening night took place on Saturday October 17, 1992, when special guest Fabi Paras joined Paul Myers and Paul Bleasdale on the decks. Week two Andy and James graced the decks and made regular appearances for many years. By 1993, the success of Cream's Saturday nights lead the organisers to expand Cream to include a new late opening night called "Full On", known colloquially as the Cream All-Nighter when the club stayed open until 6am. Full On first took place on 28 May 1993 and continued on the last Friday of each month after that. Cream soon grew to attract over 3000 people every week from around the UK who saw it as a lifestyle and not just a source of entertainment. 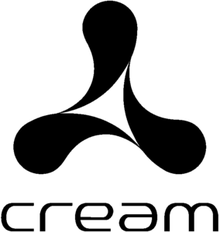 In 1995 Cream expanded operations again to promote its first international event in Ibiza, and continues to host one of the biggest club nights on the island at the award winning club Amnesia. Cream has since become the longest running UK Club night to stage events on the party isle. With Ibiza's cosmopolitan crowd the Cream story soon began to spread around the world and the company was soon organising events in places as varied as Buenos Aires to Moscow. The company now stages over 100 events annually and its international activity has gone on to become one of the company’s greatest achievements. Buoyed by the growth of the brand, the company decided to organise its first outdoor event, and in 1998 Creamfields was launched into the UK festival market. Over the last 15 years Creamfields has gone on to become the world’s biggest dance festival, staging events from Spain, Czech Republic, Romania, Poland, Russia, Chile, Brazil, Australia and Argentina where it has become the biggest 1 day dance festival in Latin America. On top of its busy international activity, Cream continues to host a handful of sell out shows a year at its spiritual home Nation in Liverpool, and celebrated its 20th Anniversary with two parties with a line up that included Fatboy Slim, Carl Cox, Paul Oakenfold, Pete Tong, Steve Angello, Paul van Dyk, Eddie Halliwell and Paul Bleasdale. Over the last 20 years Cream has gone from strength to strength and demonstrated its ability to stretch beyond its beginnings. Paul Bleasdale was the main resident DJ at Cream from its beginnings in 1992 through to 2002, since closing down its weekly operation in 2002 it still continues to host between 3-5 Cream events at Nation every year. The last parties in Nation were held on October 17, 24 and December 26, 2015 . In April 2016 Cream Nation was demolished. Wolstenholme Square the location of Nation is getting redeveloped and a new subterranean music venue will be developed on the same footprint as the legendary club venue. The venue 'Nation' which is home to Cream is made up of 3 separate rooms, each of varying shape and size; the 1400 capacity Main room, 650 capacity Annexe and 850 capacity Courtyard. Since Cream ended its weekly club nights at Nation in 2002, Nation has continued to hold other events, such as the longest running and biggest student night in the UK Medication at Nation Chibuku, Film Premiere Aftershow parties, MTV and Yo-Yo. Cream also hosts the dance music festival Creamfields each year in Daresbury, Cheshire, England on August Bank Holiday weekend. Creamfields has won the award for Best Dance Event at the UK Festival Awards a record 6 times since the awards began 10 years ago, they celebrated the win once again in December 2014 when they scooped the award once again. In 2010 they also won the highly coveted Music Week award for 'Festival Of The Year' beating off the likes of heavyweight festivals such as Glastonbury, Reading and Leeds. Cream's compilations to date have sold over 5 million units. In 2012, Live Nation acquired the Cream brand. Every Thursday during the Ibiza clubbing season Cream hosts a club night at Amnesia. It is the longest running UK club night on the island , having hosted parties there since 1994 and held down a successful summer residency at Amnesia since 1996. The label has had a history of releasing DJ mix albums, originally from their own label and later Deconstruction Records (1995–98), Virgin/EMI (1998–03), WEA (2004–05), Ministry of Sound (2006–11) and New State Recordings (2011–present). Releases from the club have been acclaimed. One of its earlier releases, Paul Oakenfold's Goa Mix, originally broadcast on radio, was described by Resident Advisor as "groundbreaking in its cinematic two-hour scope" and an "Essential Mix frequently cited as the best and favorite by both listeners and DJs." Cream Live Two (1996) featured Q's 1997 list of "The 10 Best DJ Mix Albums...Ever!". Cream Beach 2002 (2002) was noted by AllMusic as an example of how, "as usual, Cream has gone out of its way to compile an album appropriately, and impressively, suited for such [communal] occasions." Paul Oakenfold's Creamfields (2004) was subsequently nominated for "Best Electronic/Dance Album" at the 2005 Grammy Awards. Many of their albums have also been commercially successful, most evidently so with Cream Anthems 2001 (2000), which reached number 1 in the UK Compilation Chart. Between late 1993 and early 1995, the club released a number of DJ mixes that were recorded live at the club as D.A.T. quality recordings. The mixes were released on cassette, and were only available in the club's shop, because the music was not officially licensed. In mid-1995, the nightclub teamed up with electronic label Deconstruction Records for commercially released mix albums, beginning with the acclaimed Cream Live (1995), a double album with four individual DJ mixes from Graeme Park, Pete Tong, Paul Oakenfold and Justin Robertson respectively. Three further volumes of Cream Live were released. The second volume, Cream Live Two (1996), featured Q's 1997 list of "The 10 Best DJ Mix Albums...Ever!". It featured three full mixes by Paul Oakenfold, Nick Warren and James Lavelle, whose variety of styles made the album appeal to a broad range of music fans. Two further volumes, both simply titled CreamLive, were released in 2000 and 2001 respectively. The longest running series of Cream albums was Cream Anthems, which began with the self-titled volume in 1995, mixed by David Morales and Paul Bleasdale. There was not a volume in 1996 but there were two more DJ-mixed volumes, Cream Anthems 97 (1997) and another simply titled Cream Anthems (1998). The brand moved to Virgin Records/EMI for the latter release, and from 1999, volumes in the series, and indeed many of the brand's releases overall, were digitally mixed. This move was a commercial success as Cream Anthems 2000: Once in a Lifetime (1999) reached number 2 in the UK Compilation Chart, whilst the following volume, Cream Anthems 2001 (2000), was the commercial peak of the series, peaking at number 1. Nonetheless, the subsequent volume, Cream Anthems 2002 (2001), only reached number 18, which was the last standard annual release, instead being followed by Spring 2002, Trance 2003 and Trance Ibiza 2009 editions. Cream Anthems Spring 2002 was another success, reaching number 3, but the number 25 peak of Cream Anthems Trance 2003 brought the curtain down on the series until the Trance Ibiza 2009 album. There has been several releases since in the series, including the retrospective collection Cream Anthems: 20th Anniversary (2012). Owing to the club's association with the electronic scene on Ibiza, especially as they own the island's popular nightclub Amnesia, Cream started another series, Cream Ibiza, which began in May 1999 with the release of Cream Ibiza Arrivals which followed by the bookending Cream Ibiza Departures in September 1999. Another Cream Ibiza Arrivals was released in May 2000 but there was no accompanying departures album. The next instalment was simply titled Cream Ibiza (2001) and since then, releases have been more sporadic. Cream also launched a series of albums celebrating the Creamfields festival, which began with an album celebrating the third event in August 2000. One instalment in this series, Creamfields (2004) mixed by Paul Oakenfold, was nominated for "Best Electronic Album" at the 2005 Grammy Awards. After a move to WEA in 2004, Cream released two Cream Classics albums. They have been three anniversary retrospectives, the Cream10 EP (2002) covermount into the Daily Star, Cream 15 Years (2008) and Cream Anthems: 20th Anniversary (2012). Cream10 however was a promotional collection of contemporary tracks. The brand moved to fellow nightclub Ministry of Sound's label in 2006 and then to New State Recordings in 2011. The release of Cream Beach 2002 prompted Allmusic to say that "as usual, Cream has gone out of its way to compile an album appropriately, and impressively, suited for such [communal] occasions." Chuckie - Who Is Ready To Jump? Sidney Samson & The Flexican - Do You Like Bass? ↑ "Live Nation Buys EDM Entertainment Company Cream Holdings Ltd, Owner of Creamfields Festivals". Billboard. 9 May 2012. ↑ "RA News: 10 years on - Paul Oakenfold's Goa mix still sounds fresh". Resident Advisor. 1 2 Q; October 1997 issue. 1 2 Jason Birchmeier. "Cream Beach 2002". AllMusic. 1 2 "Chart Log UK".